This is Jacob Bushman, my great great grandpa. He was born in Lancaster County, Pennsylvania in 1830. I went to bed last night thinking about him and his adventuresome life and I woke this morning dreaming about him. In my dream, I kissed his left cheek just above the whiskers and smelled his smell and felt his warmth. What a sweet dream to wake up in! Jacob married Charlotte Turley in 1857 in San Bernardino. She was 10 years younger and a had also come west with the Saints. Jacob and Charlotte had 10 children, all born in Lehi, Utah. My great grandma, Grace Honor Bushman was number seven. A few years ago, I was making phone calls, trying to track down all the living descendants of Jacob and Charlotte. It was my birthday. I phoned a lady living in American Fork named Marian Anderson Barker. She had married Arthur Eugene Barker, the youngest son of Charlotte’s youngest daughter, Ella Isadora. Marian was born in 1922. She seemed thrilled to talk to me and tell me about her family. 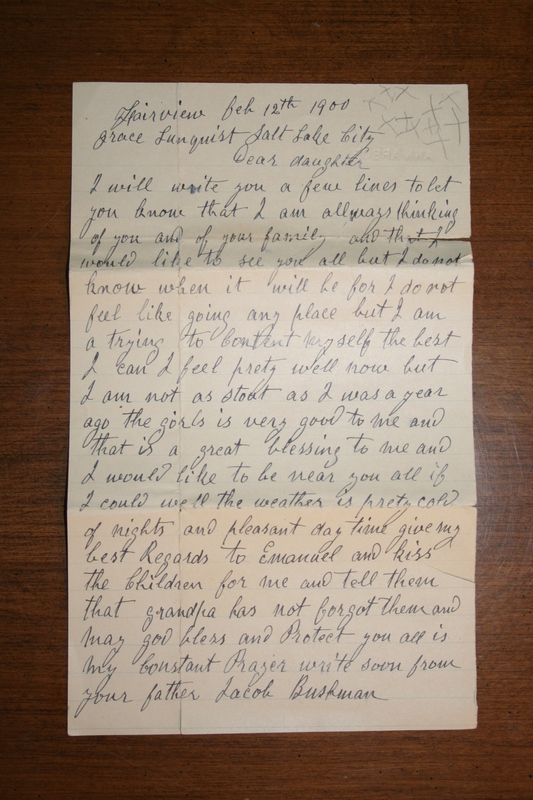 As we visited, I learned that she had a letter from grandpa Jacob written in 1900. She said one page was written to my great grandmother, Grace, and the other page to her grandmother, Ella. After locating the letters, she phoned me back and read Jacob’s words to me. It was one of the best birthday presents I’ve EVER received. It was as if Jacob was speaking directly to ME. It was like a message from heaven! 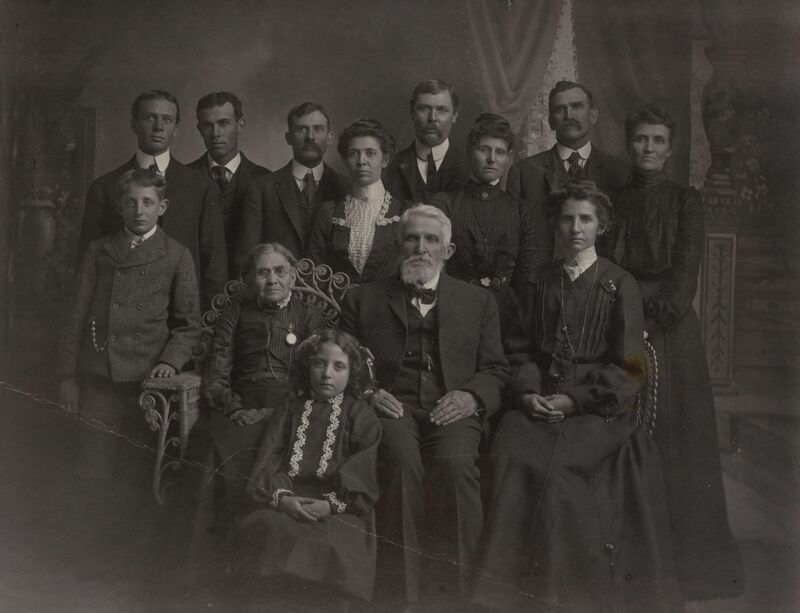 Below is a photo of Jacob and his family, probably taken in 1899 after Charlotte’s death. Jacob lived 20 more years, farming in Fairview, Utah. The log cabin he and Charlotte lived in is still there. I love Jacob and Charlotte. Out of all my ancestors, I feel particularly close to them. It’s been a joy to learn about their lives and become acquainted with their descendants. Today I honor Jacob on this day of his birth. I came across your blog while doing some light research on Theodore Turley. I’m his direct descendent through Charlotte as well. My maiden name is Barker, you may know of my parents and grandparents. Thank you for this sweet reminder of the Fairview cabin. I remember taking trips out there with my grandma, Tennie Barker, and her telling me the stories my grandpa, Don, told her of his life there. Hi Ali! We are 3rd cousins! Thanks for writing. I talked with Charlotte Barker a year or two ago and she helped me to update your branch of the family. It’s probably time to update what I have. We’ll need to talk! Did you see the posts from last month about the Theodore Turley research trip I took to Toronto? You might enjoy those. I’m going out of town this week, but will be back next. Let’s talk. My email is annlewis@byu.net. Thanks! Alene, according to my records Jacob Issac (b 1876) was the 8th child of Jacob and Charlotte, not the first. My great grandfather, Theodore Martin (b 1863), was the first son. They had 8 other daughters. It’s all good. Ann, thanks for that wonderful family picture. I’ve never seen it. I wish I knew who each person was.